MANHATTAN — The bed bug epidemic that has plagued the city for nearly a decade finally appears to be waning. 2011 was the first year since the launch of the city’s 311 system that the number of bed bug-related complaints and city-issued violations dropped, according to new data obtained by DNAinfo. The numbers suggest that after years of panic about bed bugs taking over everything from apartment buildings to movie theaters and high-end hotels, property owners have gotten the upper hand. "I think the problem did not expand at the level that people had expected and anticipated," said George Shea, a partner at Bed Bug Super Dogs, which uses trained pooches to sniff out the blood-sucking critters. The number of bed bugs reported to 311 dropped for the first time since the system was launched. Shea said calls are down 40 to 50 percent versus late 2010 and early 2011, when he would receive hundreds of calls a day. "I think what’s happening is a lot of the hype has disappeared," he said. 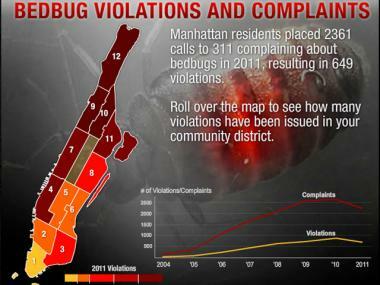 According to city numbers, 311 complaints about bed bugs in Manhattan dropped last year from 2,649 in 2010 to 2,361 in 2011 — a decline of nearly 11 percent. The drop comes after years of steady increases, which saw the numbers soar from just 103 complaints in 2003 to 2,553 in 2009 — an increase of more than 2,000 percent. Violations issued by the Department of Housing Preservation and Development, which follows up on all 311 bed bug-related calls, also dropped for the first time last year, with 649 violations issued in Manhattan in 2011, versus 846 in 2010. There were just 17 bed-bug violations issued in 2004. HPD spokesman Eric Bederman said that, while it’s too early to say for certain that the tide has turned, the city has ramped up efforts to inform the public about bed bugs, which he said is one of the best weapons to combat their spread. People are more vigilant and there is more and better information available about how to prevent and deal with infestations, he said, citing efforts like the city’s online bed-bug portal, which has extensive information about how to recognize and treat infestations. The city also implemented new rules in 2011, which includes efforts like forcing owners to inspect and treat nearby units if bed bugs are found and forcing repeat offenders to provide written verification that infestations have been properly treated. But bed-bug experts caution that the numbers may not tell the whole story because of changes in New Yorkers’ approach to the bugs. While people may have previously panicked, turning to 311 when they suspected an infestation, today people are much more likely to turn to private exterminators or their landlords for help. Landlords have also become more adept at dealing with the problem, with plans in place to provide immediate intervention instead of letting the problem fester, experts said. "Now, they do deal with it so people don’t have to call 311 to report their landlords." Eisenberg said that, unlike Shea, he hasn’t seen any decline in the number of bed bugs he’s treating, and still gets more than 100 calls a day. "Bed bugs are still extremely active," he said. "It hasn’t slowed down at all [even though] people think it has." Bed bugs stored in a plastic jar. Still, the numbers show that there are still significant geographical differences, with certain neighborhoods still feeling most of the bite. While just a six complaints were logged with 311 from Downtown's Community District 1, Central Harlem’s District 10 logged a skin-crawling 542. In general, Northern Manhattan neighborhoods fared worse than others, with 451 complaints logged in Washington Heights and Inwood’s Community District 12, 249 in East Harlem’s Community District 11, and 341 in West Harlem’s Community District 10. The city's West Side has also been hard-hit, with 187 complaints in Chelsea and Hell’s Kitchen and 183 on the Upper West Side — about equal to Murray Hill and the Upper East Side combined. 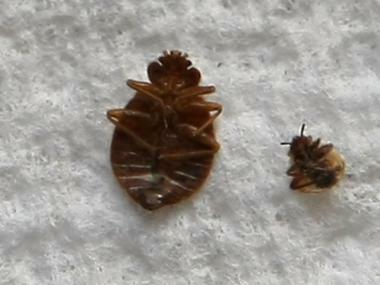 But Eisenberg said that one of the reasons for the differences is not that bed bugs are more prominent uptown, but that residents in higher-income neighborhoods are less likely to reach out to the city — either because they live in more expensive buildings with the resources to treat problems quickly or are more willing to drop hundreds of dollars to hire pricey private exterminators. Those who own their own apartments are also less likely to file complaints, he said. The proliferation of new exterminators that have entered the market also may give the appearance that there are fewer complaints, he said. Others, including Louis Sorkin, an entomologist at Entsult Associates, said that while many residents are more informed, there are others who are still clueless about bed bugs, letting the problem fester for years. "There are also those infestations in which the people don't want anyone to know, so they don't say much at all, don't report it and unfortunately try some of their own remedies that usually fail," he said.